These love knot earrings pack a lot of meaning and style into a petite package. Two spiraling strands move through the love knot in unison, symbolic of two individuals walking through life together and sharing one another's joys and sorrows. The love knot itself is picture of unity, as the loops from which it's formed can never be pulled apart. In addition, this motif lacks a beginning or an end, which makes it a perfect picture of a love that doesn't run out. Crafted from 14K yellow gold, this pair has classic styling that will make it an enduring favorite. Earrings measure 11mm and weigh approx. 2.3 grams. 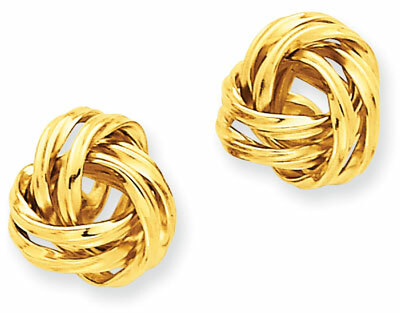 We guarantee our Love Knot Stud Earrings, 14k Yellow Gold to be high quality, authentic jewelry, as described above.